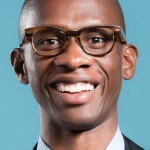 Troy Carter is an American businessman, born in Philadelphia in 1972. Originally a member of the short-lived rap group 2 Too Many, he worked for Puff Daddy before setting up his own artist management company. In 2007 he became Lady Gaga’s manager, helping her sell over 24 million albums and 90 million singles. He split with Gaga in 2013. He is an active investor in over 50 technology startups. He lives in Los Angeles with his wife and five children. Carter will appear as a Guest Shark on ABC’s Shark Tank, taking the place of Kevin O’Leary on one show. The season, which premieres on September 25, will also have Chris Sacca and Ashton Kutcher as Guest Sharks. Carter says he is excited to join because of the show’s ability to reach Americans outside the Bay Area and New York hubs, “specifically kids that look like me” from less privileged or minority backgrounds. I love Silicon Valley, but it doesn’t have a patent on innovation and entrepreneurship. These are legitimate business negotiations with entrepreneurs who are spending their own money. The daggers were out along with the checkbooks. TechCrunch announces that Carter will participate in a live on-stage interview at Disrupt SF 2015 on September 21st-23rd at San Francisco’s Pier 70. It will be Carter’s second appearance at the conference.